Rogaska Crystal Safari Bowl 10" x 6"- 24% Lead Crystal. Condition is Used. There is some small chipping on two of the pointed edges of the bowl. See photos. This was acquired in an estate sale and comes as is. It makes a lovely 'ting' sound that rings out a while when gently tapped. Shipped with USPS Priority Mail. DELIVERY CONFIRMATION WILL BE USED. RICCI Lead Crystal Bowl, Fine Heirloom NEW in BOX. Gorgeous Crystal in wonderful Velvet Gift Box. Bought as a wedding present. Wedding did not happen. Hand Cut 24% Lead Crystal. New In Box. Very good condition - did find one chip on a tooth - see photo - does not take away from beauty of bowl as tooth is still in place and level with others. Royal Limited Tulip Crystal Punch Bowl Set. Condition is New. Shipped with USPS Priority Mail. This item is in very good condition. This is a beautiful bowl. This is a heavy piece of crystal with intricate details. 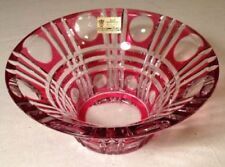 Fifth Avenue Crystal Aurora Ruby Accents Large 12" Wide X 5 3/8" Tall BOWL - NEW IN ORIGINAL BOX - PLEASE SEE ALL PHOTOS AND CONTACT ME WITH ANY QUESTIONS! - SHIPS TO YOU FROM A SMOKE FREE HOME BY USPS PRIORITY MAIL OR ECONOMY USPS PARCEL SELECT, YOU CHOOSE AT CHECKOUT! - THANK YOU FOR LOOKING! 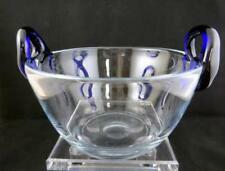 This is a sleek Riekes Crisa “Moderno” crystal punch bowl set with a mid-century modern design. - 1 Clear Glass Hand Blown Ladle (14" long). 14-Piece Punch Set includes Material : Hand-Blown Glass. Item measures 8" across by 3.5" tall. This item is in very good condition. This is a beautiful bowl. Quarterly Inventory Reduction Sales in January, April, July and October. It’s heavy! It weighs over 7 LBS. It is about 11" long, 8 3/8" wide, 5" high and the glass is 3/8" thick. The bowl is in excellent condition. It is heavy, weighing a little over 5 lb. Royal Danube Clear Crystal Grape Leaf Bowl. Gorgeous hand painted etched crystal bowl depicting purple and gold grapes. Versatile functional bowl or just a beautiful display piece. 10.5" across the top and 5" tall and weighs over 3.5 lbs. Gorgeous VIOLETTA 24% Lead Crystal Votive Bowl HAND MADE in Poland w/Sticker NEW. Bombay mark acid etched on bottom. Classic waffle-cut design is stunning! Gorgeous Cut Crystal Rose Bowl in Excellent Like New Condition. Beautiful heavy lead crystal. You won't be disappointed! Width 4 1/8 in. Absolutely beautiful! Approximately 6" tall! If you're not happy, I'll make it right. Thank you! Heavy Clear Crystal Glass Serving Bowl Silver Plate Rim 9” Dia. Cut crystal heavy serving bowl, 9 inches in diameter, 4 inches high. Item weight is 3 lbs 12 ounces condition is very good, no chips cracks or rust near the silver plate trim edge. Shipped with USPS Priority Mail. Nambe Crystal Foliage Bowl 5 7/8"
Good condition. No cracks. There is a tiny micro chip on the top, outer rim. When you run your finger over it there is a slight roughness, but it isn't noticeable. Also, there are a few small scratches/scuffs on the body. Charming, sparkly small etched and cut crystal rose bowl with wire frog. Etched chrysanthemums and primroses on pedestal base. Approx 3-1/2” height and 4” across. Hard to see any markings but looks like acid etched partial signature on bottom. Vintage Pedestal Lead Crystal Glassl Centerpiece Bowl Ornate Brass Bottom . For sale is a Radiance Collection Crystal Rose Bowl. Made in Poland. Gorham Crystal Oval Bowl. Pattern is Althea. Measures 7 5/8" long by 4 1/4" wide. Clear. Very Good used condition. A few small, shallow scratches on it. See all photos for all condition issues. Heavy, weighs over 3 lbs. Shipped with USPS Priority Mail. VERY GOOD CONDITION with 1/4" SMOOTH CHIP AT RIM. Heavy, sparkling. Lovely crystal rose bowl. Like new in pristine condition, still has sticker in it. Beautiful pre-owned lead crystal bowl - 5" tall and about 51/2" wide! 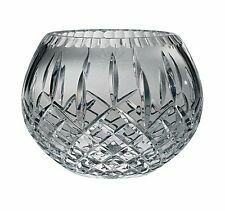 Gorgeous cut crystal bowl is in the popular Rogaska Gallia pattern. 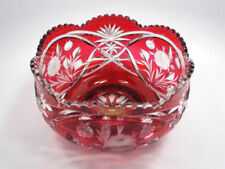 This lead crystal bowl, with scalloped rim, is approx. New In Box. The Box shows signs of shelf wear. 2 1/2" Across the bottom Base. Crystal Fluted Paneled Centerpiece Trifle Bowl ~ In Mint Condition! The base is 3" tall with the 6" bowl on top. It is in mint condition. This could also be used as a trifle bowl. I do this, so that I can carefully inspect each item and look for any obvious flaws, that might otherwise be missed. Aurora Ruby Plate/Bowl. Fifth Avenue Crystal. This is a lovely crystal rose bowl on a brass pedestal base. I am unsure of maker, but I believe it is Godinger Crystal. The overall height of vase on pedestal is 12". Unique 2 Piece Fine Crystal Square Bowl with Dish Entertain Party NEW! Fine Crystal Square Bowl with Dish. Great looking bowl and dish for entertaining! Dish has round feet on the bottom. Set of 4 Hoya crystal bowls in the Pomona pattern. The bowls are 6 7/8” across, and 1 1/4” deep. The bowls are in nice pre owned condition, they still have their stickers on them so I don’t think they’ve been used. They come in their box. The box is not perfect, it has been stored and shows shelf wear. Hand Cut Crystal Glass Bowl with Brass Stand 7 inches tall Beautiful! CRYSTAL GLASS FOOTED COMPOTE/BOWL-ETCHED FLOWERS-PEDESTAL-PRINCESS HOUSE?